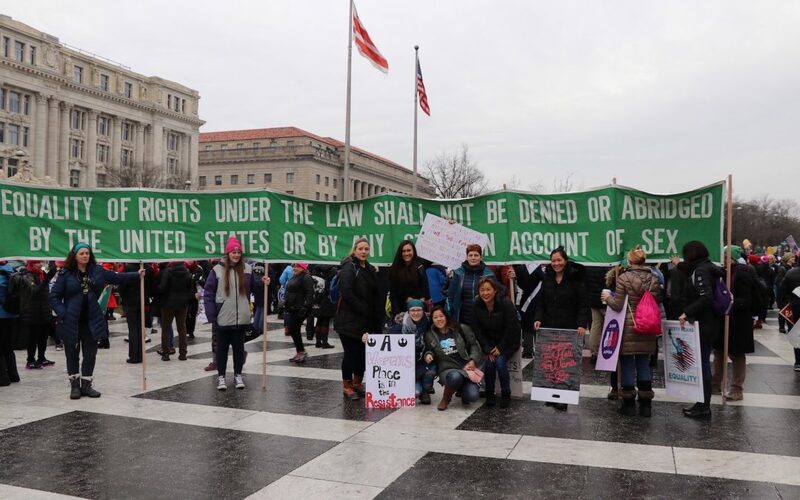 WASHINGTON — Thousands gathered in Washington, D.C., and around the nation today for the third Women’s March with an agenda that included support for a long-time staple of the women’s movement, passage of the Equal Rights Amendment. The ERA has returned to the national stage somewhat unexpectedly in 2019 with Virginia on the cusp of becoming the 38th state required to meet the threshold for ratification. White, 30, was one of about 18 people who attended the smaller rally organized by Cheri Borsky, a Jewish activist from Maryland, who said she felt uncomfortable supporting the Women’s March after reports of anti-Semitic comments by two of its leaders. Last Wednesday, the Virginia Senate ratified the ERA by a comfortable majority and the amendment must now pass the House of Delegates before the end of the 2019 legislative session on Feb. 23. Virginia state Sen. Jennifer McClellan drove to Washington from her district in Richmond to speak at the alternative rally. McClellan, an attorney, served in the House of Delegates for 11 years before becoming a state senator in 2016. “We have the votes if the bill comes to the floor,” said McClellan, a Democrat. First, the bill must clear the Privileges and Elections Committee, which is chaired by Republican Del. Mark Cole, who does not support ratification. “He could bottle it up in the committee,” McClellan said. She said she is hopeful that Republican Speaker of the House Kirk Cox, a retired civics teacher, could intervene. “It’s a matter of good government to bring it out of committee for a vote. He’s the most powerful person in the House, and he could make that happen,” she said. On the other end of Pennsylvania Avenue, a crowd of thousands gathered for the third year to march past the Trump International Hotel and rally at Freedom Plaza. High school students Nicole Malanga, 18, and Elizabeth Bennett, 17, of Sunapee, N.H., spent $450 of their savings from waitressing and hotel jobs to fly to D.C. for the march. Both had studied the ERA in AP History courses. “It’s necessary and it’s vital,” Bennett said. “It shouldn’t be more complicated than that.” Malanga skipped a midterm and Bennett skipped a basketball game to attend the Women’s March. “I lost my starting position for the rest of the season,” Bennett said. None of the Women’s March leaders responded by press time to requests for comment on the group’s support for the ERA or on future plans to weigh in on developments in Virginia.